I would like to take this opportunity to thank Maxx for his hospitality and his guidance. It cost 10 bucks...GREAT..we thought...but then he got a call to come back....Sorry..your xray will cost 7 times more ss the British require two senoir docs to verify the xtay and we must translate it using the UK format.... what a crock of BS..
At Maxx's suggestion I tried to open a Georgian bank account as my Russians will stay here longer and it is easier to provide to pay their rent, etc., in the locsl currency and I forgot to pay Maxx for the food he loaded the fridge with...so I can refund him, too. It took 20 mins and the visa card should be ready tomorrow. Will be interesting to see if I can send GBP to Georgia via paysend and if it is prompt. Maxx has found a wonderful place to live and the people are friendly. Maxx and I visited two cities in Georgia that were temporarily occupied by Russia in 2008 ..the port of Poti and Gori..Stalin's birthplace. Frankly, I found both towns depressing, but Maxx found THE best Hachapuri and Harchou soup restaurant just ofc the main highway .. Nothing can beat his find. Photos to follow.. my dropbox will not load until 30 percent is on my battery. Thanks Blighty..THAT is where we went...The lady on reception WAS told what the test was for and thankfully someone woke up, there. Things are good and cheap here, like dentistry, medical and banking services. You just got to watch to see if you get what you would expect in the West. They tend to cut corners here. I look forward to seeing the photos. I went on to a low carb, medium protein, high fat diet, or a Ketogenic diet. My diabetes went away almost right away. My weight is steadily dropping. So far I've lost 149 pounds, nine pounds of that in the last 2 weeks. So far I am down 162 pounds as of my last weigh-in today. I'm losing about 1 kilo a week. I was told years ago that 2-3 pounds a week of weight loss is what to aim for. August 19th last year was when I started the ketogenic diet. I should be pretty close to my goal weight by my one year anniversary. Or at least looking pretty reasonable. I ate so far today hamburger, eggs, sour cream, cheese and mushrooms cooked in butter and coconut oil. My coffee has cream in it. High fat diets work because they don't spike your glucose/insulin levels and keep you satiated. Anyway I am really happy. Maxx, what is the best website reference that will lay out the details of your Ketogenic Diet? 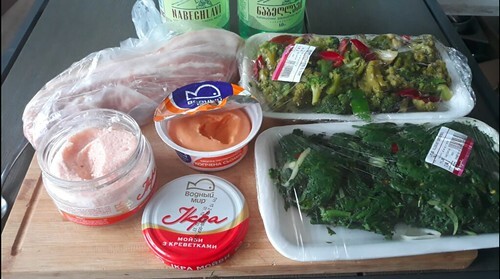 I've not been drawn to any Keto websites yet except the one RWD123 recommended. That one is not about the Ketogenic diet per se but it recommends it. It is mostly for older men who want to restore their health, get their vitality back and live healthily decades longer. You want to be lean and muscular and to fight aging, and you've come to the right place. Welcome to Rogue Health and Fitness. I’m P. D. Mangan, age 64. I am so glad you are doing this. When you have good results you can inspire others such as your sister. I've asked this question a few times but have yet to hear from you on it. Do you have access to watching youtube videos? Some of the best information on this diet comes from youtube. Have you watched any of the videos by Dr Jason Fung, Dr Annette 'Boz' Bosworth, Dr Eric Berg or 'Butter Bob' Briggs? Bob takes you through a Wal-Mart grocery store and explains what you can eat and what you can't. He is a layman but he is in my opinion a very good source of information, a plain speaking Tennesseean. He cuts through all the nonsense and tells you how you should think. He has a recommendation of a sweetened called "Da Vinci" you might like in your coffee or tea (I'd ditch Diet Coke as soon as possible). Another character I recommend for his recipes is an East Indian fellow and his wife, google "Headbangers kitchen youtube". After you get into this I'll send you some recommendations of supplements you can take to enhance your health and weight loss. The best way to do this diet is not to sweat it. Just do it here and there and learn. Eventually you will get it. OK Maxx, thanks for the info. An update about my trip to Georgia..where I met Maxx and we drove back together to his home in Batumi..
You will see, Maxx's Butumi, Stalin' s Gori.. Your home is FAMOUS ! 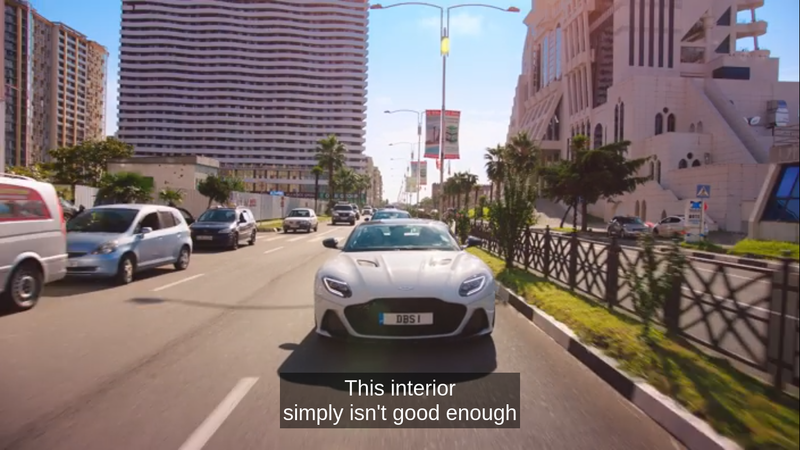 As Jeremy Clarkson says just before this screengrab -.. " this doesn't seem like the former Soviet Union"
If I was producing the show I would cut down the sim by 90% and have more scenery shots. And in the sim I'd have cattle in street needing to be dodged. 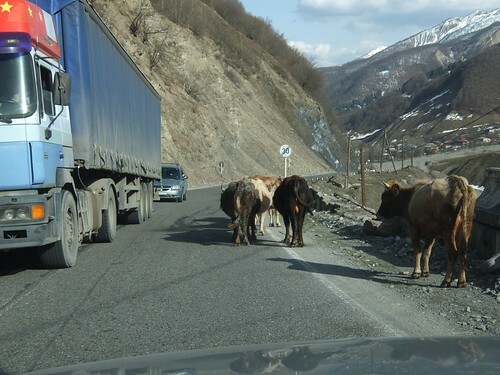 I almost hit a brown heifer on the highway on my way to Tbilisi. I think the government here encourages the herders to graze their cattle along the roads to keep the weeds down. You never see lawn mowers along the roads just herds of cattle. I'll let you watch it on my account when I'm next over ! I should give you a better answer. The key to weight loss is get the body to use body fat as fuel. This happens when there is a lack of glucose in the blood, tissues and organs. That happens when you restrict your daily carbs to 20 grams or so. What you want is to keep your insulin levels low and this happens with carb restriction. Foods high in fat like cream instead of milk, create almost no glucose/insulin reaction. Proteins need to be limited to about 100-180 grams per meal otherwise they will bump up the glucose/insulin levels. 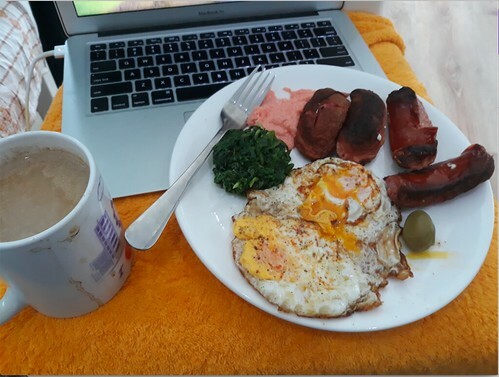 Bacon and eggs are wonder foods for going into ketosis (fat burning). Fat in the diet satiates the appetite. Have you ever noticed after eating high carb foods like cookies and cake that you get hungry right away? Then you have to eat again. Calories do count, but so does glucose/insulin. Yes, thanks Maxx for the more complete info. I have lost 3-4 pounds since my operation, mostly because I didn't feel like eating as much as I used to, so need to get started in serious way to follow up. Wife needs to do the same as she found she didn't look good in some dresses she was trying on when heading out to Citizenship Interview. She has been wearing jeans (which are all filled with stretch material for women) so she didn't notice anything she didn't fit into until this recent event. But I don't think she has the will power to do it. The best way to get going on a ketogenic diet is just make some keto food dishes. When you see how good they taste it is encouraging for the diet. Eventually you get hang of the diet and the bad food choices become less and less. It helps to have the refrigerator stocked with the right food and to have things you can snack on. As example I keep caviar in the refrigerator. If I get hungry I eat a spoonful of that. Of course it doesn't cost much here. Or you could make some deviled eggs using mayonnaise made from olive oil for the yokes with paprika and bacon bits sprinkled on top. It is totally ketogenic. Ever heard of the story about the doctor who back in the 1850s did a diet experiment on a group of 5 men? He had these guys come live with him. He would track their health eating only certain foods, one month potatoes only, the next month something else. He found the best food was minced meat or hamburger along with water and coffee. Dr Salisbury created the Salisbury Steak. Salisbury served as a physician during the American Civil War, and became convinced that diarrhea suffered by the troops could be controlled with a diet of coffee and lean chopped beefsteak. Salisbury was one of the earliest health food faddists and taught that diet was the main determinant of health. He believed vegetables and starchy foods produced poisonous substances in the digestive system which were responsible for heart disease, tumors, mental illness and tuberculosis. He believed that human dentition demonstrated that humans were meant to eat meat, and sought to limit vegetables, fruit, starches, and fats to one-third of the diet. The Salisbury steak, his means of achieving this goal, is ground beef flavored with onion and seasoning and then deep-fried or boiled and covered with gravy or brown sauce. It was introduced in 1888. Salisbury saw beef as an excellent defense against many different physical problems. He suggested that Salisbury steak should be eaten three times a day, with lots of hot water to cleanse the digestive system. He was an early American proponent of a low-carbohydrate diet for weight loss, and he promoted his diet for that purpose. His diet became known as the "Salisbury diet". It has been described as an early example of a fad diet  The Salisbury diet was promoted by Elma Stuart in her book What Must I do to Get Well?, that went through at least 32 editions. Salisbury steak is similar to a number of other dishes made of ground beef. Its name caught on partly because World War I inspired a movement in English-speaking nations to avoid German-sounding terms such as "hamburger"
100 years ago there were no medications to prevent epilepsy. Epileptics where treated by the ketogenic diet. The brain actually functions better running off of ketones than it does glucose. Ketone are much smaller in size than glucose and are able to penetrate the brain cells easier. That is why the doctors in the know advise a ketogenic diet for Alzheimers patients. Alzheimers is essentially insulin resistance (type 2 diabetes) of the brain. Without the brain cells being fed energy they die. An interesting story about US Navy SEALS and ketosis: For a while Navy SEALS were having problems with epileptic fits while diving. This was very dangerous of course. The rebreather was the cause, but it was a necessity to maintain stealth. So the Navy tried epileptic medication. It worked but it took the edge off the SEALS. Drugs numbed them and took the alert fighting edge away. So they tried a ketogenic diet and it was problem solved. I've noticed I am thinking clearer. I'm not forgetting things like I used to. My memory is better. Learning Russian is easier than it used to be. For a while I was wondering if I was heading for demential. Maybe I was. Maxx, thanks for this additional info. 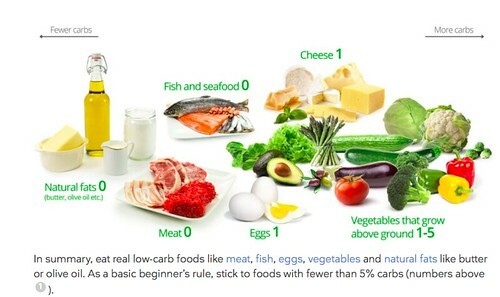 The Keto diet stresses avoiding carbs. With fewer carbs for body to burn, body starts burning fat and we lose weight. But . . . Keto diet lets us eat much more fat than most people do anyway . . . so if we are eating fat, the body will burn that newly eaten fat (or store it) and not burn existing fat. Max, how do you explain this allowing the eating of fat, if we are trying to get rid of fat to lose weight? And then there is the cholesterol angle. Cholesterol kills via the heart and via stroke from clogged vessels. Eggs = cholesterol. Fat = cholesterol. Just like with any diets, if you eat too much it does not work. The "more fats" is relative - higher percentage of fats comprising the diet, but not necessarily more than your body needs and uses throughout the day. A normal carb diet has a disadvantage with regards to sugar. Sugar will give an initial boost of energy, but will also spike insulin levels as a reaction to convert excess sugar in the blood to fats for long term storage. The first blow is this conversion of excess sugar into fat and storage. The second blow is that you will feel tired (the sugar crash) after the initial energy boost fades, and the excess sugar that is converted to fat is not processed because the body is in sugar burning mode. The ketosis cycle takes time to ramp up, during which time you are temped to eat more from hunger. If you starve yourself for a while then ketosis can take over to burn body fat, but most people tend to eat before this happens. And the longer you wait to eat, the more chances you will overeat due to hunger and not wait long enough for ketosis. A second way the keto diet can help you loose weight is that fats and protein are typically larger molecules than sugar and carbs and take longer for the body to absorb. This helps people feel full/sated while not absorbing all the calories at once. For example, the primary component of olive oil is oleic acid, C18H34O2, a much larger molecule than glucose - C6H12O6. Sugar starts being absorbed right away and takes about 2 hours to be completely absorbed. Fats and protein take about 12 hours. Thank you Steve for an excellent post. I've noticed on the past when I lost a lot of weight it started with a bout of the flue. What happened was I was sick and couldn't eat for a few days. After I got better I noticed I had lost weight. I also wasn't hungry. So I decided to not eat so much and I continued to lose weight. I got down to my ideal weight. But bad eating habits and food choices I put the weight back on. But it took a several years to do so. That was age 16 to about 23. What I didn't know then (age 16) was I was in ketosis. That is why I didn't feel hungry. My body was burning fat as energy and the hunger hormone ghrelin was turned off. In addition my fat cells were putting out leptin, which is an appetite suppressor. I have watched that show 'My 650lb So Called Life'. I see these morbidly obese people who struggle to get out of bed. Most of the program is them arguing with their doctor about why they are not losing any weight (They are eating pizza and drinking Coke). I get irritated with them and can't accept what they are doing. But I understand the battle of the hormones in their messed up bodies. The fatter you get, the hungrier you get because of the appetite stimulant ghrelin. The appetite suppressor hormone leptin, no longer works in these people. So they have an enormous struggle to lose weight. I'll get into the cholesterol on another post. The body digests the food we eat into glucose for energy. What isn't taken into the blood stream winds up in the toilet. It doesn't think during digestion that animal fat consumed belongs with body fat so that is where it should go. "Fat makes you fat" is not true unless you eat too much of it. As Steve said, eat too much and you won't lose weight. There is a doctor, an MD by the name of Annette Bosworth or 'Doctor Boz' She did a video entitled "Fruit is Evil". Of course fruit isn't evil and she would admit to that. It is just that by eating fruit most of its carbohydrates in them are stored as fat. She said in her youtube "The body doesn't care where the carbohydrates come from. It uses about the first 7 grams of carbohydrates to maintain your blood sugar level. The rest of the carbohydrates gets converted to fat." As example a 3 inch medium size apple has 25 grams of carbohydrates. 7 grams of that will be used to maintain your blood glucose level of around 100. 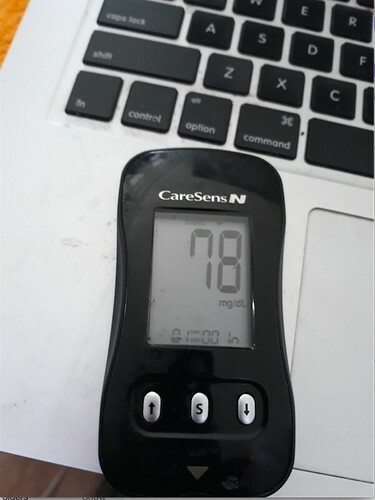 The other 18 grams of carbohydrates in the apple will increase your blood glucose level. This triggers an insulin response to get that glucose out of your blood. Insulin blocks fat burning so you want it to stay low. These extra carbs are converted to fat by the liver. 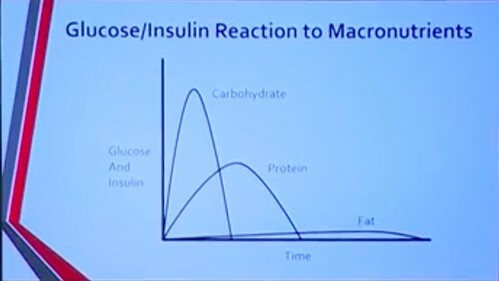 By eating fat or a limited amount of protein instead there will be little increase in the glucose level and little increase in the insulin response. Frankly it was too much. 2 eggs is OK. 2 sausage halves instead of 4 would have been better. Processed meats are not good for me. A couple of slices of bacon would have been better. The green stuff is spinach dip. The pink stuff is caviar, high on Omega 3s. And there is an olive. My coffee has cream in it. Cream is fat so it causes little or no rise in glucose levels. Milk does. However it is high in calories so I am going to cut it down to one cup a day and drink iced green tea instead. Overall I need to cut the calories down. The good thing is I do not get hungry when I eat this kind of food. And my blood glucose levels stay good. No more taking insulin injections! My morning blood glucose level. I know this photo doesn't look too exciting, but it does for me. I was told by my doctors, MDs, that type 2 diabetes can't be cured. I was also told I would not live a long life. Type 2 diabetics that were as severe as me rarely do. Yet here is proof the doctors do not know everything. The light pink and orange stuff tastes like caviar. The orange stuff is very creamy and the pink stuff tastes like there are little eggs in it. I have eaten red caviar before and they are clearly fish eggs b b size. What is this stuff? Is it some sort of blend? It is really tasty. They are about $2.25 each. Are you certain its not blended fish guts. At that price, the caviar content is minimal. Probably similar to our smoked whitefish spread, which is smoked fish less skin and large bones blended with mayonnaise , cream cheese, and condiments. Based on the lid label, it's the caviar from capelin. It's mixed with small shrimp to make that particular spread. That crossed my mind and male fish.... ahhh... never mind. It sure tastes good. I think Gator is right about a mixture of fish eggs, mayo and cream cheese.